New York facial plastic surgeon Dr. Yael Halaas, has found great success with surgical hair restoration which takes donor hair from other areas of the head and moves it to the thinning or balding areas. “The vast majority of women experience thinning hair when they hit menopause, but unlike men who thin in the front, women get diffuse thinning around the entire head so it can be a challenge to find a donor area,” she says. 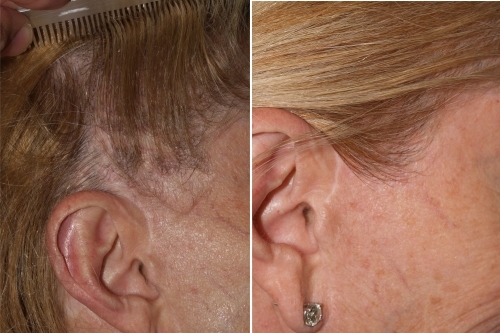 This procedure can be costly at $4000 and up, depending on how many grafts are needed, but the results are permanent. According to Dr. Halaas, tight braids and extensions pull on the hair which can also result in hair loss. “This type of hair loss is called Traction Alopecia which we see often on African-American women,” she says. She also advises against using Propecia to regrow hair because it is not FDA approved and can cause dangerous hormone levels in women. Don’t need surgery, but still need help. Check out the new pHormulate hair care line. This anti-aging system uses ChromaGuard technology to restore moisture bonds which are lost during the aging process, resulting in dull and lifeless hair. The line consists of an ammonia free coloring system and styling products that contain natural ingredients such as sage, rosemary, chamomile, lemongrass and goldenseal which are combined with the ChromaGuard technology to reverse the signs of aging hair. Maybe you’re just not using the right brush. 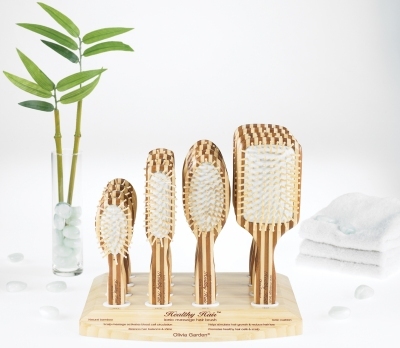 The Olivia Garden Healthy Hair bamboo brushes not only help detangle and style hair, but they can be used to massage your scalp, which stimulates blood flow, resulting in hair growth and reduced hair loss. If you are looking into anti aging products you should make sure that the product you choose helps build up collagen and elastin. As one grows older, the ability of the skin to perspire is reduced. Thus more and more people experience dryness of the skin because aging also leads to decreased levels of oils into the skin. A diet rich in fruits and vegetables can contribute to the elasticity of your skin.A good anti-aging skin care treatment never underestimates the value of taking 10-12 glasses of water daily. A healthy way of life will sure have a great impact on your anti aging beauty treatment.